Biowalls are indoor biological air purification systems that are composed of a variety of plant species and microorganisms that live in their roots. 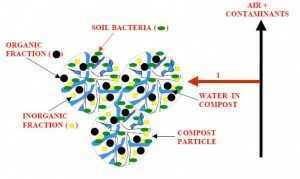 They are used to enhance indoor air quality, and improve the well being of building inhabitants. 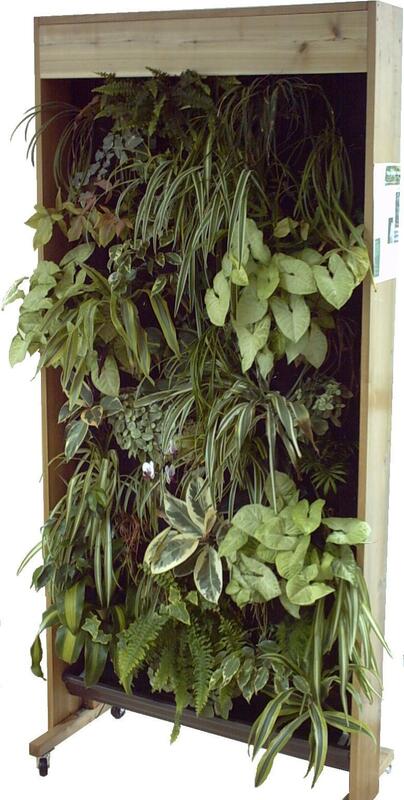 The plants are typically grown on a vertical surface which allows airflow through the wall, and over the root system. 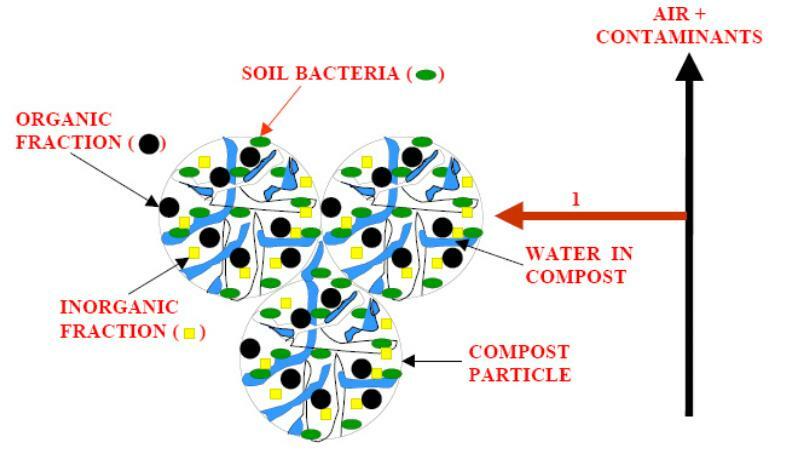 Through microbial activity, airborne contaminants such as carbon dioxide and VOCs are degraded into end products that are harumless to humans and the environment. The biowall structure can be built into the building or attached to the outside of a wall with cladding. 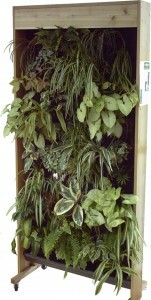 This wall is an example of a portable system, that has its own air circulation and watering system. Larger biowall systems can be attached to the HVAC system in the building or they can stand alone as a passive purification sytem. Due to high costs of implementing a large biowall into an existing structure, this small scale portable system is an effective way of improving the air quality in a small room. It is also meant to provide a demonstration of what could be implemented on the large scale. This Biowall is made of a Cedar Frame, with a layer of plastic lattice, used for the backing support of the wall-which still allows air to be pulled through the back. The next layer is a sheet of industrial felt, which holds the plants in place and helps to retain moisture for the plant roots. For the middle layer, where the plant roots are embedded, coconut fibre mats were used. These were spread out evenly over the first felt layer, and then covered with a front layer of felt. In between the two felt layers, an irrigation system was installed. A water reservoir was attached at the bottom of the wall, from which a small pump feeds a water line that runs up the side of the wall. This line feeds a pipe with drip holes that slowly saturate the wall. The water then trickles down the wall by gravity. While the majority of the moisture is retained in the coconut matt as well as the felt layers,the excess water is recycled from the reservoir. In addition, six fans at the back of the wall allow air to be pulled through the wall and distributed throughout the room. Does it Purify the Air? 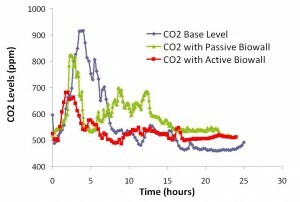 Preliminary air quality tests were conducted in a computer lab in the CHBE building to determine if the biowall could actively improve the indoor air quality. A computer lab was chosen as computer boards and printers are a known source of VOCs. 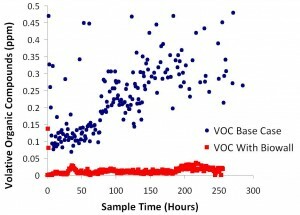 Results showed the biowall did have an effect on the indoor air quality of the computer lab, reducing both CO2 and VOC concentrations. 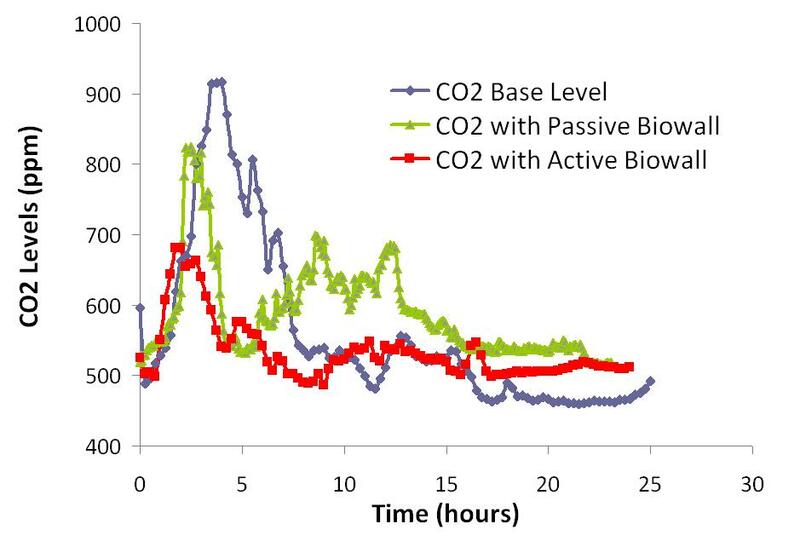 A modest reduction in CO2 concentration was achieved with both passive (fans off) and active filtration (fans on). 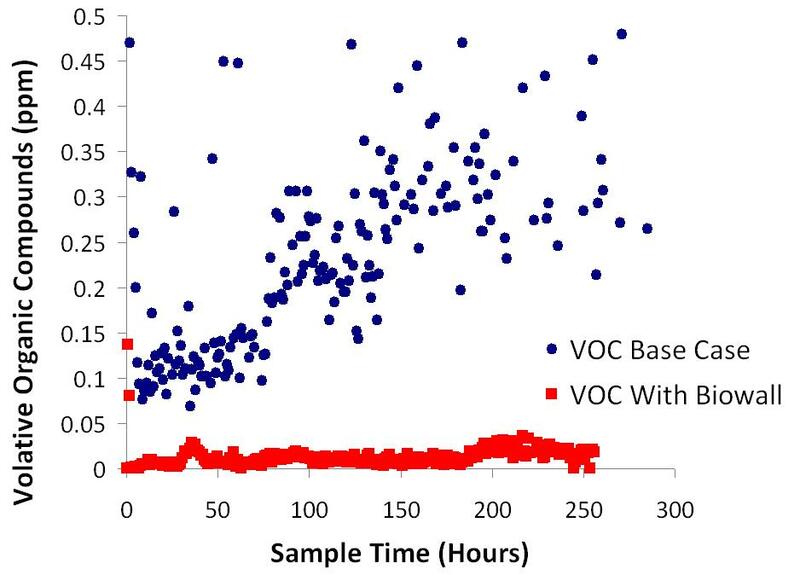 VOC concentration in the lab was greatly reduced with active biowall filtration.